£22.80 per set of 6 & FREE Delivery in UK. The pins are crafted by ourselves in our workshops in Derbyshire, UK. The material used is Birch hardwood with Black Oak Dot. Included is full fitting instructions and a sanding kit is also provided if any fine adjustment on fitting is needed to obtain a snug fit. This benefits both the tone and sustain of the guitar. Cone Top Diameter : 5.5mm (0.22 inches). Cone Base Diameter : 4.3mm (0.17 inches). Cone Length : 24mm (0.94 inches). Cone Angle : 3 degrees. Dot Size on pin head : 3mm (0.12 inches). Slot width : 2.2mm (0.08 inches). Slot goes through the collar. The pin material is Birch hardwood with a black dot made of black Oak. The Birch wood used is European grown and is a very strong and durable hardwood. 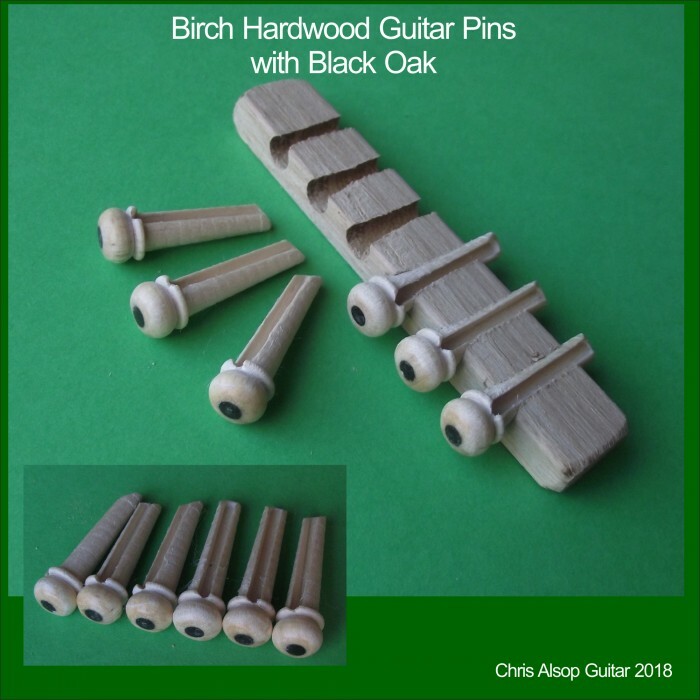 Birch has a hardness that is about the same as Oak which makes it ideal for guitar pins. When cut, it is white in colour and the fine grain allows a high sheen finish to be made on the ball and collar of the pin. I can finish these pins with either Beeswax polish, which results in honey coloured pins, or I can polish them in talc which retains the original white color. 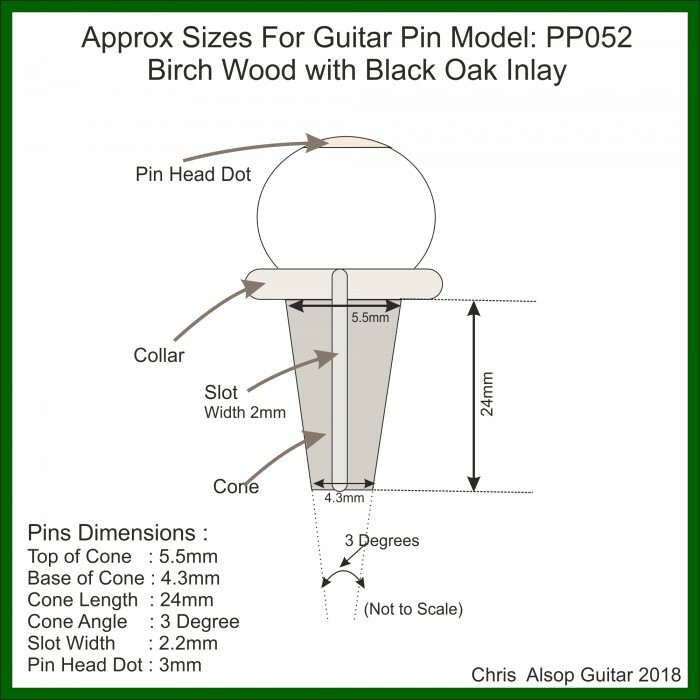 Instructional Advice Sheet for fitting of guitar pins. A sanding kit is provided if any fine adjustment on fitting is needed. This is a pin puller made By Chris Alsop in his workshops in Woodville, Derbyshire, UK. 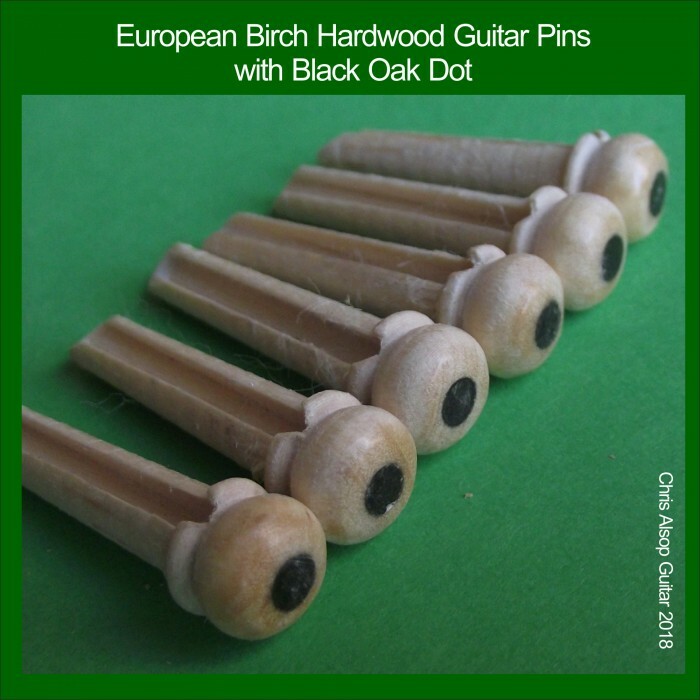 Features ..
Set of 6 Guitar Bridge Pins, Water Buffalo Bone with Abalone Inlay. 5.5mm at collar. These pins a.. The pins are crafted by ourselves in our workshops in Derbyshire, UK. They are OVERSIZED with the si..